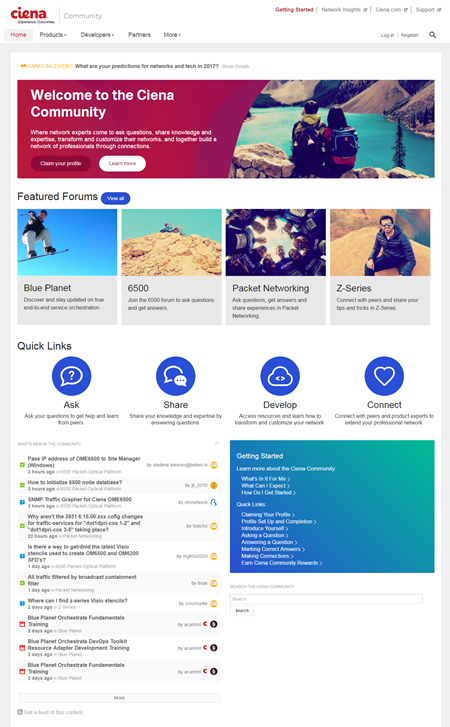 From Open line systems, the evolution of APIs, closed-to-open disaggregated platforms, and our Blue Planet DevOps Exchange, the ability of our customers to communicate in an open forum with their own counterparts and with our Ciena teams has become critical. Ciena's Brodie Gage highlights our new Ciena Community -- an endeavor not without challenges but well worth the work. Brodie Gage is VP of Product Line Management at Ciena, and is based in Montreal, Canada. Ciena has always endeavored to be a customer-centric brand. From our highly consultative model to our focus on start-to-finish support and engagement, this isn’t anything new. It’s what has defined us in our space, and I love that we’re known for that. Yet as the industry and broader culture moves more into open networks and transparent dialogue across the board, Ciena, like every other brand, has had to evolve our own understanding of what it means to be proactively customer-focused. Our new community is an expression of that. Last fall, Ciena rolled out a new and open virtual gathering place called the Ciena Community. This new space for our clients, partners, and connections is a place to ask questions, share knowledge, explore network transformation and connect with other professionals in our space. It’s always a bit of a gamble to roll out an open community but so far we have seen tremendous traction and dialogue with more on the way. But this blog is more than just a promotion of the Ciena Community. It’s about a revolution in how we work together. The ability of our customers to communicate in an open forum with their own counterparts and with our Ciena teams has become critical, an endeavor not without challenges but well worth the work. This focus on openness isn’t just a result of Google flattening the landscape of information gathering. The age of openness is about not only learning and discovering but also contributing; about joining in the innovative and developmental process of the products and services we use everyday. I believe this is the real secret of success in the Ciena community and for any brand or service provider that truly is interested in listening to their audience. This priority of listening has, and will always be, central to the Ciena relationship. We like to think of it as simply part of our how we do what we do, “Learning as a best practice,” if you will. The incredible part of the story as it relates to our community is that now our traditional customers are engaging with ICPs, MSOs, enterprise and submarine customers. It’s a bit like how some of our MSO customers have traditionally collaborated but with a sophisticated and complementary technology solution that really lets conversations happen organically. From Open line systems, the evolution of APIs, closed-to-open disaggregated platforms, and our Blue Planet DevOps Exchange, the ability of our customers to communicate in an open forum with their own counterparts and with our Ciena teams has become critical, an endeavor not without challenges but well worth the work. We’ve pushed through it and feel it’s a great outcome. While it’s impossible to have full insight, to have an all-encompassing total customer picture, with the Ciena Community we have a window and a voice into what our customers are saying and sharing. This is incredibly useful and a practice that’s built into everything we do at Ciena, from R&D to support to sales. It’s customer insight at its best. Is the future of Ciena something we develop in partnership with our customers? It sure is. Let’s make this journey together.